This exceptional regenerative mask for ultra-dry. brittle and damaged hair works to repair and transform hair instantly and over time. The sumptuous, melt-in formula envelops each fiber in prodigious nutrition, restoring elasticity and strength to renew hair with ultimate softness, suppleness, and shine. Ultra-rich formula designed to replenish and regenerate hair without weighing it down. Breakthrough ingredient: Sapote butter is 2x as rich in Omega 6 fatty acids than Shea butter. This treatment envelops the hait fiber to transform even the most damaged hair while infusing deep-down repair and nutrition. Hair regains its strength to reveal supple, soft and radiant hair. This Exceptional Mask delivers serious repair, hydration and featherweight softness with dazzling shine. For thick hair: After shampooing, on towel-dried hair, apply a quarter-sized amount to mid-lengths and ends. Comb through to distribute evenly and leave on for 5 to 10 minutes or longer if needed. Rinse thoroughly. 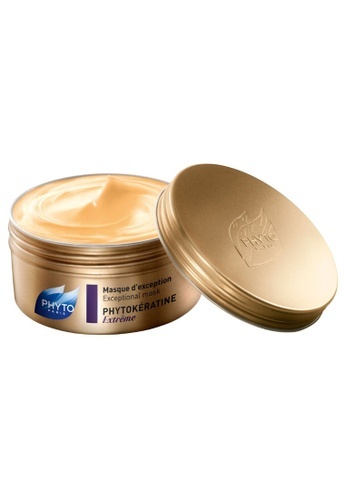 For a complete restorative ritual, Phyto Paris recommends using Phytoelixir Subtle Intense Nutrition Oil once a week. Can't find Phytokeratine Extreme Mask in your size?